Here are nine new ways to make slaw. Slaw—a crunchy salad of thinly sliced vegetables—is the perfect picnic side dish because it usually holds up for hours after its made. Cabbage (the cole in coleslaw) is classic, but don’t limit yourself. Here are nine ways to make slaw. 1. Asian-inspired. For a refreshing and extra-flavorful slaw, add ingredients like miso and ginger, or fish sauce and Sriracha to your slaw. 2. Spiced. Play around with the spices in your dressing, adding, say, caraway and celery seed, turmeric and coriander, or chipotle in adobo. 3. Grilled. To soften and sweeten the cabbage slightly, cut it into wedges and grill. 4. Broccoli. 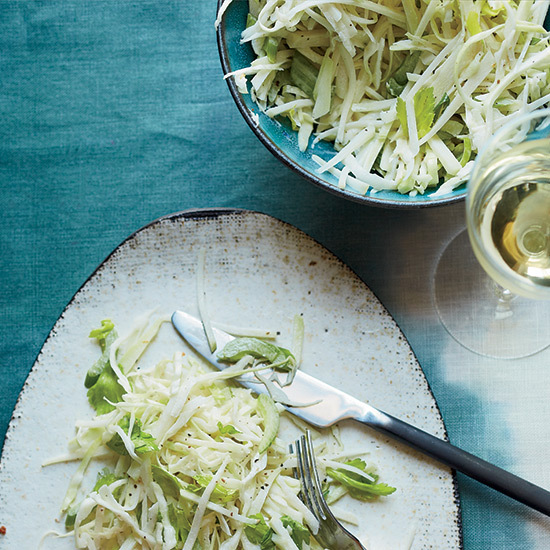 Instead of throwing out your broccoli stems, turn them into a crunchy slaw. 5. Kohlrabi. This other–worldly looking vegetable is crunchy and mild; perfect for slaw. 6. Green Bean. Make a vinegary green bean salad with julienned vegetables, and go ahead, call it slaw. 7. Beet. Raw beets? Yep. Toss them in a citrusy dressing for the ultimate California take on slaw. 8. Fennel. With its anise-like flavor, fennel makes a terrific slaw that’s great with Italian ingredients, like bresaola. 9. Zucchini. OK, so it’s not the crunchiest vegetable in the world, but shredded zucchini absorbs lots of flavorful dressing, making an especially delicious slaw.